There comes a time in the life of some people when they find themselves getting crushed by their enemies from all sides and absolutely no sign of relief is seen to appear from anywhere. During such times, many people lose faith not only in themselves but also in the Supreme Power. However, for a person who holds onto his/her faith and surrenders to one particular form of Mother Almighty, gets rid of all the enemies in life. We are talking about "Goddess Baglamukhi". Goddess Baglamukhi or Maa Baglamukhi or Devi Baglamukhi, is one of the '10 Mahavidyas', and is associated with a massive amount of occult powers. 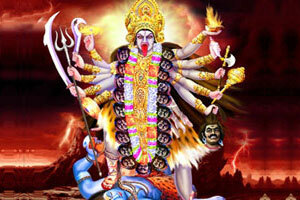 In the Holy Scriptures, She is also called the Brahmastra (the super destructive celestial weapon of Lord Brahma). Maa Baglamukhi is a ruthless vanquisher of all the enemies of Her devotees. If a person manages to please Maa Baglamukhi, even the greatest of enemies are defeated. She impairs the speech and intellect of your enemy who is bent on harming you. Maa Baglamukhi destroys all the effects of black magic or evil eye casted upon you by your enemies. Since Maa Baglamukhi removes all enemies from Her devotee's life, it is seen that by worshipping Her, a person in some cases even witnesses people who were once hostile, suddenly turn friendlier and stop doing harm to him/her. She is also worshipped by practitioners of occult for acquiring occult powers in life. So, how can a person please Maa Baglamukhi to get rid of all enemies and severe obstacles in life? By going for a Baglamukhi Puja! Baglamukhi Puja is a spiritual ritual performed to please Maa Baglamukhi and get Her blessings in life. Therefore, we urge you too book a Baglamukhi Puja and get relieved from all troubles of the physical and non-physical worlds. Baglamukhi Puja bestows the blessings of Maa Baglamukhi upon the individual, which acts as a weapon in destroying all enemies (open as well as hidden) who intend to cause fatal harm. Baglamukhi Puja protects an individual from black magic, evil eyes & negative energies, by creating an aura of protective energies around him/her. Baglamukhi Puja blesses the native with great health and protects from ailments caused by black magic or any other supernatural influence upon the native. Baglamukhi Puja protects the wealth & assets of an individual from enemies looking to get a hold of them. Baglamukhi Puja brings the individual out of any disputes or legal hurdles revolving around his/her property. Baglamukhi Puja protects the business of an individual from hostile takeovers. Baglamukhi Puja shields the person from unjust pressure and harassment from people with high influence in the job place. Baglamukhi Puja protects the native from being a victim of adverse incidents in life. Baglamukhi Puja provides protection from the possibility of accidents, blood shed and even an unnatural Death signified by the planets in the horoscope of a native. One who offers Puja and Homa to Maa Baglamukhi is relieved from all legal problems. Goddess Baglamukhi has the power of turning things into its opposite such as: Ignorance into Knowledge, Defeat into Victory, Poverty or Shortage into Wealth or Abundance. Baglamukhi Puja brings forth the real motives of people involved with us and save us from being tricked, cheated or deceived by their outward appearance. Baglamukhi Puja on your behalf of the Sacred Mantra that invokes the blessings of Maa Baglamukhi, done by highly learned Brahmin Priests to bring forth the divine blessings of Goddess Baglamukhi in your life. Note: The Baglamukhi Puja is performed in strict accordance with all Vedic rules & rituals as prescribed in the Holy Scriptures. Why should I go for Baglamukhi Puja? Goddess Baglamukhi is a very fierce form of Mother Almighty that gives protection from all kinds of evil to Her devotees. Therefore, one should not miss the opportunity of pacifying Rahu & Ketu and enhancing the luck factor in life by the Baglamukhi Puja. Who will perform the Baglamukhi Puja? Absolutely, you can watch the Baglamukhi Puja being performed in your name via a recording provided to you by us. Is there any minimum age to go for Baglamukhi Puja? No. Anyone can go for this Baglamukhi Puja. Can I book the Baglamukhi Puja for someone else in my family?